On Thursday we went to our first Italian restaurant. We dressed a little classier and headed to Trattoria Fresco, which is downtown Sioux City next to the Sioux City Hotel and Convention Center on Jackson Street. From the moment we walked in, we knew we were in the right place. The nice orchestra dinner music playing over the speakers created good background sound to set the mood for our nice meal. The host seated us immediately to our table with our cloth napkins set up creatively on our plates. I was in a great mood for this meal. We ordered some bruschetta alla fresco and a plate of imported Italian meats and cheeses for appetizers, which was a great decision because they tasted great. 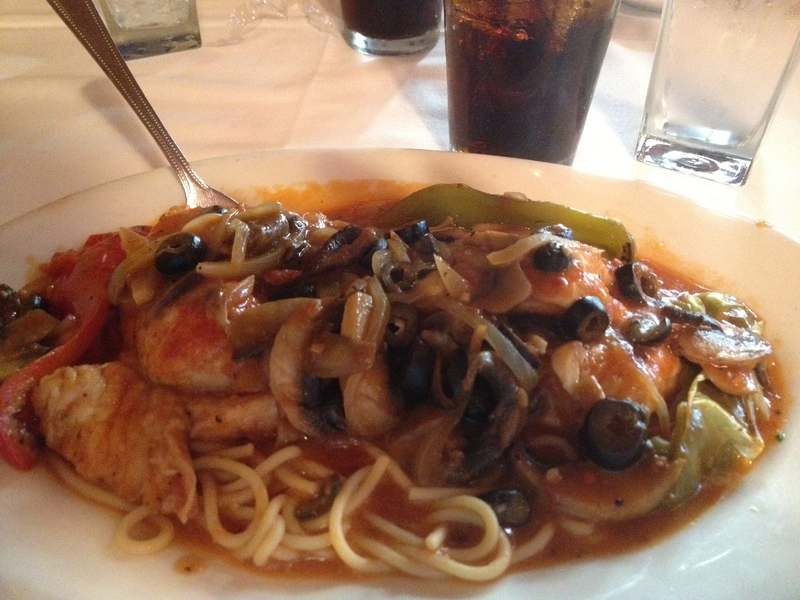 I had a tough time deciding what I wanted to order for my entree, but ultimately chose the pollo alla cacciatora, which is a chicken breast in pasta with vegetables on it. We ate our appetizers fairly quickly, so we had time to wait for our food. Between the two waiters that took care of us, our bread basket and glasses were never empty. They did a fantastic job always checking on our table to make sure we had everything we needed. My food came out and filled a huge plate! I already knew it would be way too much for me to handle, but I was excited to eat it for supper later that evening as well. The sauce was very good and the meat and vegetables went great together. The sauce was a red wine and tomato with basil mixture and it had a sweetness to it. Our waiters continued keeping our bead stocked, so I was able to dip the bread in my pasta sauce which tasted amazing as well. The pasta was very filling and eventually I got to a point where I had plenty to take home and I was comfortably full. We checked out the dessert menu and found a few options to sound pretty tasty, but it was an easy decision for me to order the tiramisu. 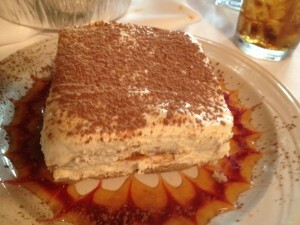 I had tiramisu at an Italian restaurant in Las Vegas a couple months ago, so I wanted to see how good it would be here. It came out and it was a massive piece. The presentation of it was even better. It was very moist and tasted very good. With each bite I took it kept tasting better and it was a great finish to an already delicious meal. I liked Trattoria Fresco very much. The servers did a great job taking care of us, and kept us happy throughout the whole meal. The portions were large and everything that I ate, I thoroughly enjoyed. The atmosphere was relaxing and comfortable and the classiness of it made it better, rather than some family-style pasta buffet that I was expecting at first. With the prices being what they are, I don’t think I will be headed back because of my poor college student budget, but I could see myself taking a beautiful lady there for a fancy dinner.